I'm exhausted for this special edition Nike (RED) Laces. I have tried at all Nike Stores in Bandung: Bandung Indah Plaza, Parijs van Java, and Istana Plaza. Even I went to Nike Store at Plasa Semanggi in Jakarta. Then, I contacted my friend at Medan to look at Nike Store in Sun Plasa. But, nope. There is no Nike (RED) Laces there! And last, I went to the online marketplace. Then, I got a seller that offer it for USD 8.00 with free shipping to Indonesia. Okay, deal, done! 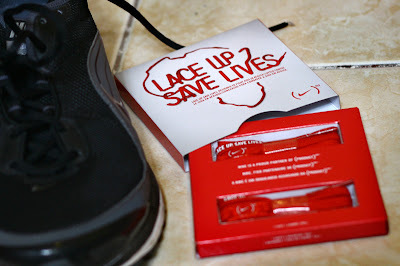 I hope these laces can give us more motivation on run, or on another sports. And here is my Nike Air Max Turbulence+ with Nike (RED) Laces. Lace up. Run out. Save lives. 6950 views. This post is copyrighted — materials from other creator are explicitly mentioned. You may use any information for non-commercial purpose with credits and backlinks. For commercial purpose, please let me know first. Hahaha... no. For casual wear I never use Nike, just Adidas or Puma. But, for running, I use Nike+ system. 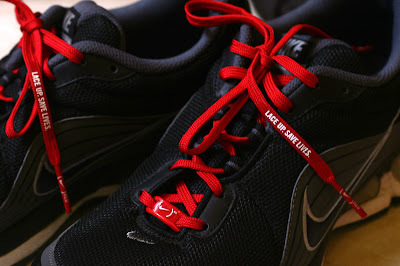 If other brand make the (RED) Laces, I will use it. But, Nike does. Every brand have their own advantages, and also disadvantages. kebetulan saya juga lagi nyari nike (red) laces. kalo boleh saya tahu, beli online di website apa yah?